I am looking for a solution to power a raspberry pi connected to a lcd screen 10 inch with three Lipo batteries 3.7V 5000mAh connected to two BMS 3S for charge and discharge. I designed the following circuit but I doubt, if it's correct. In case this is correct which is the battery life in hours? Without the manual for the BMS it is hard to give an authoritative response, but I really don't think that you can connect these devices in parallel. 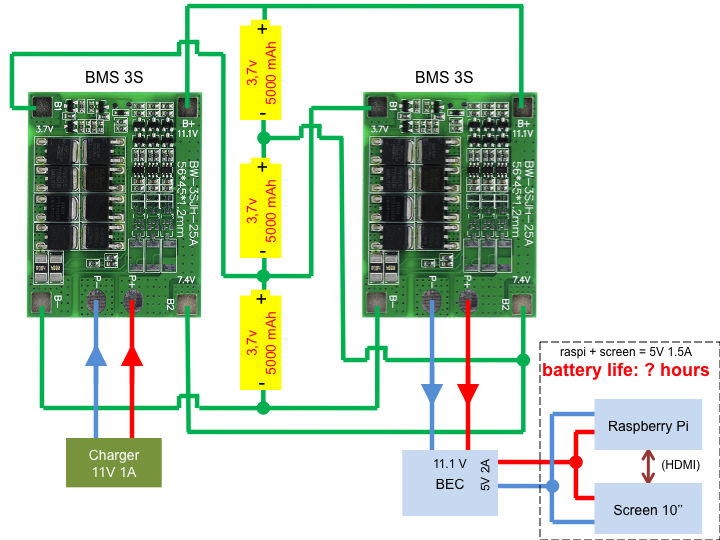 A BMS typically want "single access" to the batteries in question to control current and/or voltage. One BMS does not know how much current to add to the flow if there is another one which it has no control over. It could work if there was a secondary communication of some sort between the boards, but it appears to lack such a feature. Not the answer you're looking for? Browse other questions tagged battery-charging raspberry-pi lipo or ask your own question. How to measure 6S LIPO battery juice in percentage from Raspberry Pi?